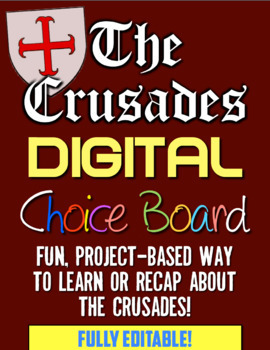 Crusades Digital Choice Board! Bring technology, choice, & fun to Middle Ages! 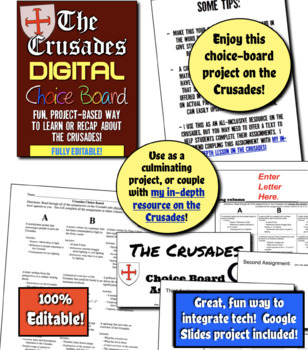 In this technology-based project, students complete a choice board on the Crusades in the Middle Ages. 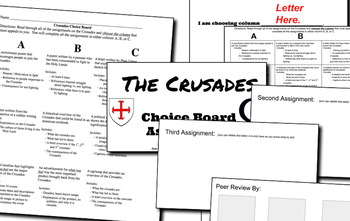 Students complete three assignments on the Crusades, choosing from column A, B, or C based on their interests and/or areas of expertise. This project is entirely editable too, so you can change whatever you need to meet the needs of your students. 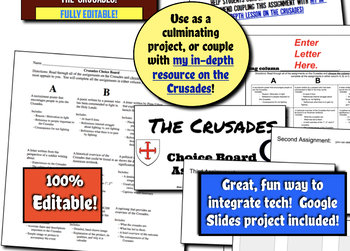 Included is a Google Slides presentation that students will use as the platform for their Crusades choice board and, once finished, the class will undergo a gallery walk where they review the work of their peers. Also included is an editable Word doc of the choice board, as well as a PowerPoint presentation that explains the process for the Peer Review. This project can be used in a multitude of ways, but I recommend either as a review of your study of the Crusades, or as a side-by-side companion to my in-depth resource on the Crusades! Middle Ages Interactive Notebook! Feudalism, Charlemagne, Magna Carta, & More! Byzantine Empire Interactive Notebook! Constantinople, Justinian, Orthodox Church! Middle Ages "I Can" Statements & Learning Goals! Log & Measure Medieval Goals! The Black Death & Modern Science: How Can We Learn More About the Plague? Middle Ages Jeopardy Review! Students Play Jeopardy to Review Medieval Times!